Child With Down Syndrome Sitting Up For The First Time! 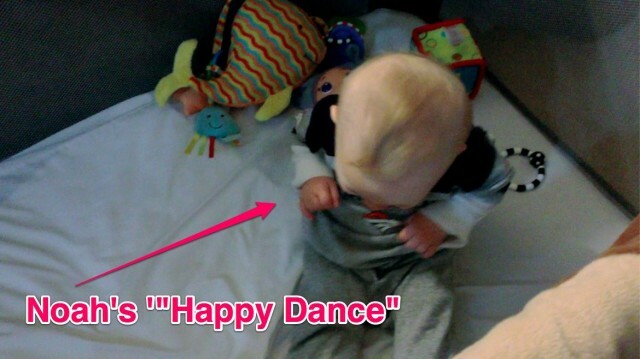 You are here: Home / Resources / Baby Developmental Milestone: Noah Sits Up By Himself! Baby Developmental Milestone: Noah Sits Up By Himself! Since Noah’s our first (and as of today, only) child I have no idea how or when a typical child is supposed to reach their developmental milestones. My wife is a pediatrician and knows that stuff like the back of her hand, but not me. In fact, I’m not really interested in textbook baby milestone charts. In fact, I sort of enjoy Noah developing at Noah’s pace. We try to make a habit in our home out of celebrating, not comparing our son’s accomplishments. Sure, there are moments (especially when we’re around typically developing children who are about the same age as Noah) when we’re reminded that Noah was born with Down syndrome, and will likely hit his developmental milestones a little later than his typically developing peers. But honestly those moments are few and far between. There’s a lot of screaming and yelling in our house. Here’s why. Our neighbors must think we’re crazy because of all the loud screaming that comes from our house. I’m sure anyone walking by our house can hear it. It’s loud. Why so much noise you ask? Well, because we celebrate like crazy around here! It doesn’t matter how big or small (no accomplishment is a small accomplishment in my book) we celebrate every win in our house. We scream, cheer, and applaud Noah’s accomplishments like the kid just hit the game winning grand slam in the world series. We have a lot of fun in our house. That’s just how we roll. Everyday’s a party when this little boy is in the house! Sitting up for the first time is an epic win! Strangely enough these large wins usually happen when you least expect it. Like today for instance, after months of Noah’s physical therapist working on his core strength, countless sitting marathons, and even beating his own (assisted) sitting record; our ten month old son decided to simply sit up all by himself! Sadly I wasn’t home to witness this milestone (in person) but thankfully my wife’s iPhone 4S saves the day again! (Isn’t it awesome that we live in a time where we can capture memories so quickly and easily?!) You can hear the excitement in my wife’s voice as she glances over to see our little boy sitting up all by himself in his pack and play. Don’t you love the uber-proud look on Noah’s face as he sits there with a much deserved sense of accomplishment? 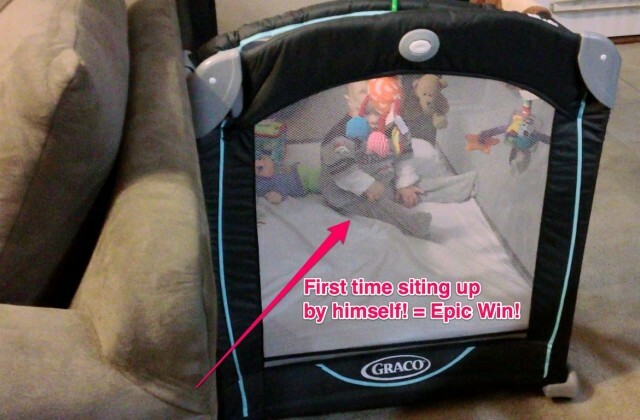 Being a parent (and a husband) is another epic win! I’m truly blessed beyond words. What recent developmental milestones have you celebrated in your house? We want to hear about them! He is doing SOOO well! Be very encouraged! God is good, and you are both exceptional parents. Go, Team Noah! I have a baby with DS and I am blessed to have him in my life, we love him so much. wow, wonderful! I’m so happy for you and your wife. It’s exciting for your own child to go through their firsts, but for a child with D/S every movement they make is a celebration. Gooooooooo Noah! Within time he’ll be standing holding on to furniture. Prayers are with you and Noah’s accomplishments. Everyday is a new day. Yay! I remember when our son (who was very delayed due to some extreme sensory issues) sat up by himself and I went nuts. It didn’t matter a bit that all of our friends with babies the same age were doing it months and months earlier. It was so exciting watching my son do something so HUGE for him on his own timetable! After all- we love our kids for their individuality, right? I’m happy dancing for you over here in KY 🙂 Way to go Noah! @megan Thanks for sharing and thanks for the kind words! And yes, I totally agree with you! How old is your son now by the way? My daughter sat on her own for the first time while I was in an informal meeting and she was on the floor. I went bonkers and they thought I was crazy, but she is far more umportant than what others think if me, so I cheered her on anyway! 21 months. She’s my little rock star. Oh yeah Noah! That is so huge! Having had 3 “typical” children before our little boy with Down Syndrome it is amazing how development with our little boy can cause joy beyond compare. Such a blessing! Thanks! We enjoy watching Noah grow and develop. How old are all of your children now? Nothing small about this win, but thanks for the reminder to stop and celebrate the victories along the way. Congrats! I use to be one of those who stayed on top of what happened by a chart with my other two but with my Ayden baby not so much. He has taught me to take each day and enjoy it. My son is ten months today and he waved bye bye for the first time at me today. I was so excited because we have been working with him for a while and all of a sudden when he is leaving he waves bye. He is trying hard to sit up. It’ll happen. That’s awesome! I haven’t got to the point with our videos when Noah waved bye for the first time, but it was awesome! I can’t wait to post it. It’s so much fun, huh? Keep up the great work. Proud of you guys. I love hearing Abbie’s voice and how excited she is! I know I was so excited when Kara (18 months) was able to sit up on her own. I’ve been terrible about keeping track of things, so I can’t actually say when she did that. 🙁 The only one I can remember is that she rolled over at 12 weeks old. I used to really stress over how delayed she might be hitting these milestones. Now my attitude is “She’s going to do it at one point or another, so why get in a dither over how long it takes.” It’s taken a lot of the pressure off of me, and I don’t have to stress about whether or not my kid took two months longer to crawl than your kid! I can just enjoy her progress for what it is! I just do my part to enable her and work with her to give her every advantage. The rest is up to her. What is her newest accomplishment? She has finally started waving! And she is just a hair away from walking! Noah sat up independently at 10 months? Looks like you have great therapists. So Noah is 15 months old but this is an old video when he was 10 months. Is that correct. A little confused trying to figure out the blog. The post was written today (to go with the video) each video has a date at the start. The go in order. If you go to the first page it’ll start at his birth, and progress, if that makes sense. Wow, 10 months transitioning from lying to sitting is very fast …Great work NOAH!!! Our little girl went from the floor to sit at 15months. I’d say he is on his way..That’s excellent. Hey thanks. It’s all him (and God.) 🙂 This little boy works hard, hard, hard. I’m so proud of him. I still remember walking into our son Lucas’ room to find him sitting up in his crib: instant tears! I was just so proud! He’s 5 now and I’m watching him play basketball outside with his brother (pretty good jump shot, even without the jump part)! Congrats on baby Noah. It’s so much fun to celebrate all the milestones! wow, basketball….now that will be fun! Rick, great video! I can´t explain you how excited we were to look at it. I even cried of joy! Today we took our 7 months old boy, Felipe, also diagnosed with Down Syndrome, to a physical evaluation and we were told about new exercises to do with him to help him sit down by himself. In other words, we are just starting our own sitting marathon. I totally share all your craziness about Noah. We know its harder but in a very positive way than a regular kid. However, I have a question: Noah is almost 16months old, right? So, the sitting by himself took place 8 months ago, right? Sometimes I get confused what is Noah doing right now. Thanks so much! And I know it can get a little confusing since our facebook page is real time, and our blog is a ‘tad’ bit behind. 🙂 But yes, he is 15 months old, but we are doing the videos in order to tell his story, and they take a lot of time to edit, write, edit pictures, etc…and we have a lot of stuff going on in life in general…so we’re behind. But…we really want to get caught up, and hoping we can in the next few months so it’s not as confusing. Yay Noah! So awesome! Thanks for putting such a happy face out there for all the world to see our beautiful kids! I have one 4 month old named Lila. We are working on rolling over and smiling! ha,ha…he is a mover and shaker for real! Yay! So proud of Noah! I love watching him and seeing what he can do, applauding all the time! Thanks so much! How old are you children? Yayyyy Noah!!!! I’m so proud for you guys! My Mordecai was standing in his crib yesterday and decided to confidently let go of the side bar while simultaneously reaching for the back bar…and he had to stretttttch while reaching, mommy was sooo proud!!!!! 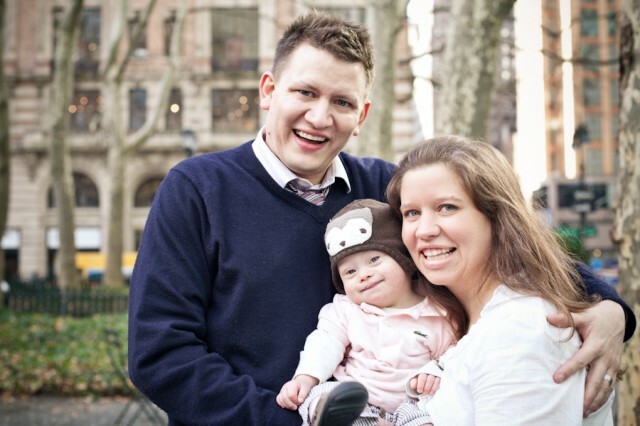 No developmental milestones for us yet as we are new to the world of Down syndrome. Our third child, Daniel, was born just 3 weeks ago and has Down syndrome. I’m looking forward to the milestones when he’s ready to get there, but for now I’m just enjoying snuggling a tiny baby again. Hi Rick, a quick question. What age was Noah when he started sitting? Thanks for your website! Hi Rick, please disregard as I have seen your post on this request. Thanks a lot. I too like to celebrate and not compare when my 1 yr old baby hits his milestones. He just hit another one last week. Using his finger and thumb to self feed. I really enjoy ur blog. I came across it and I don’t believe it was by accident. Thanks for sharing! Way to go Noah! Well that was 65 different types of adorable!! your son is awesome.. i have a concern regarding my 10 month old baby girl.. please help me.. she had colic n stomach reflex between 1-5months.. so her Dr’s advised to keep her upright position all the time.. so she din’t get opportunity to be on her tummy.. she’ll sit independently without falling down for hrs if we make her to sit.. she is not rolling over neither crawling.. now, whn we went for her 9month appointment, her ped. said that she should be sitting by herself between 9-12months, else, they will send her for physical therapy.. we have increased her tummy time more now.. now she is turning from back to tummy, but she’ll not do from tummy to back.. she is doing lot of mini push ups n holding her head up.. but she is sill not yet trying to sit up by herself.. me n my husband both are really worried.. we r new parent n have no support.. she is the only whole n soul of our life.. is there any way we can train her to sit up by herself?? i enjoyed watching all noah’s videos.. please help me in making my baby like your little one.. In our house, the neighborhood must think the same than yours. We always are cheering Silvia for everything – and her smile is like a great prize for us. Your website and fb page is a good inspiration for us. And see Noah’s development is a real privilege for anyone who wants to now more about our children… And check that are not so different than 46 chromosome children! A great hug from Spain! I remember this day very vivid and my daughter is now 14 yrs age. I was in the kitchen doing some chores and Katie was in the living room. I went in for a visual check and there was Katie sitting up and sucking on her big toe. I told her I needed to watch this again, so I laid her on her back and up she came, just like that. She always rolled to her right side to get into a sitting position, never rolled to the left. I was such a joy…. then combat crawled at 54 weeks. She had been walking the furniture, just never crawled till after one yr and then the 4-T was in two more weeks and off she went. I verbally taught her to climb up the stairs also. If you want more on that, let me know. So happy for little NOAH, it is fun to read his milestones. And yes, the first tooth was also at 9months. Thank you for your amazingly encouraging blog. I have six children and my youngest son has down syndrome. I am learning not to compare. It was hard at first. Now we just celebrate life and that all people are different. I am so happy to have my little boy. He is such a joy to this family. He may not be doing many of the things that children his age are doing at 9 months but he looks deep into a person like I’ve never seen someone do. I believe he has a gift of seeing what is really important. Your Noah is a gorgeous boy. Keep keepin on! God bless your family and thanks again. 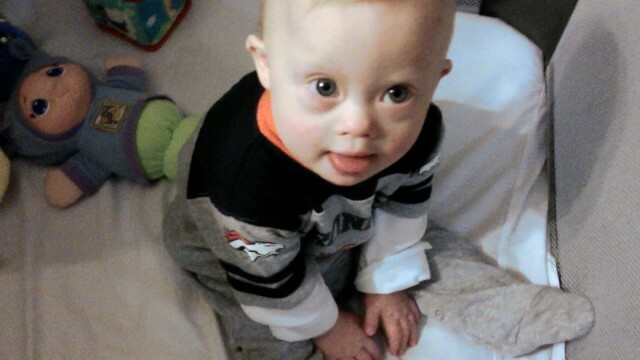 I have a grandson with down syndrome.You are very encouraging with all your post Thank you. 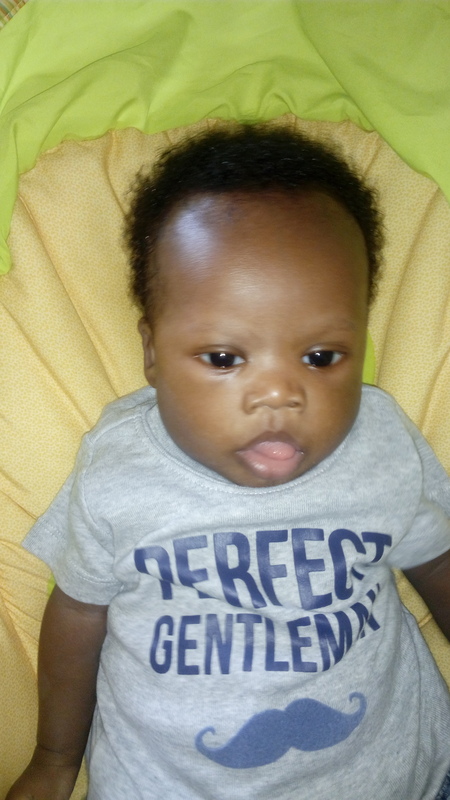 I am a mom with a down syndrome baby and its not been easy getting the support from family and friends from this part of the World(Nigeria) and would need all the support I can get to help my son reach his milestones. My son was five(5) months on 22nd May 2016. Your boy is very cute. 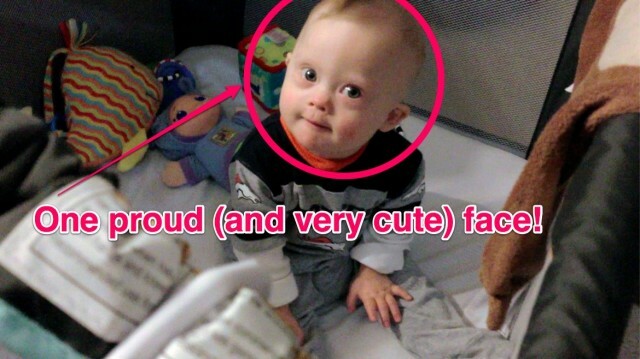 He is not a down syndrome baby he has down syndrome that all. My son had down syndrome has we live in Nigeria too. Your boy is very cute. He is not a down syndrome my dear, baby he has down syndrome that’s all. My son has down syndrome we live in Nigeria too. Grace u ain’t alone. I am also in Nigeria. I have a daughter living with down syndrome but I can tell u she is the best of all my four kids cos she cares from the heart and her love is so pure. She is nine years old and doing great at school. I am so proud of her. Early intervention is the key. My child is 6.5 months old and is beginning to stand up and crawl but cannot sit down. Do I have to worry that my 6.5-month-old child can’t sit up or even sit back? My name is Alice Brown and I am teaching a course on early childhood active play and physical activity at the University of Southern Queensland, Australia.